Thank God for power metal! It seems like there's another power metal band around every corner, in every bar and making multiple rock'n'roll recordings. You might think I'd get sick of reviewing power metal CDs but the fact is, I love 'em, I really do. 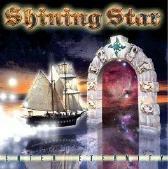 Shining Star's "Enter Eternity" is a distinguished representation of what good power metal should be. The music features soaring vocals, driving guitar and flashy keyboards aplenty ... and that's just what I want to hear from a power metal band. I liked "Enter Eternity" best when the band shifted into high gear and took the music up to a higher pace. However, too much of the music was in the slow, ballad-y style and, after awhile, I grew bored while I waited for the music to pick up. I enjoyed "Enter Eternity" but I thought there were way too many slow songs and not enough fast tunes for my taste. Still, overall, a strong album. For more information, check out http://www.myspace.com/shiningstar.